Today My Daily Art Display focuses on a double portrait by Jacopo Carrucci, the Italian Mannerist painter, who was better known simply as Pontormo, the name of the town in Italy where he was born. I featured one of his paintings on January 14th. The painting entitled Portrait of Two Friends was completed by Pontormo around 1524. Today, I am not just offering you a painting but I am attempting to unravel the mystery of the painting or to be more precise, the small piece of paper which is held by one of the men depicted in the portrait. Look closely at the painting. It is quite a dark painting with the two men sombrely dressed, almost all in black, standing against a plain grey background. 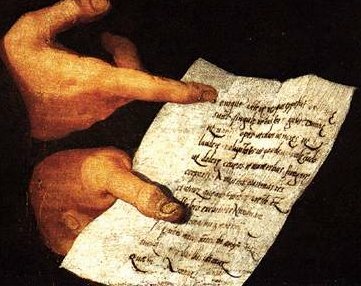 Light coming from the left illuminates the two faces and the hands belonging to the man on the left who holds up and points to a page of writing. This older man on the left is side-on to us but still manages to look at us. His gaze is not as forceful as that of the younger man and he seems to be quite pensive and preoccupied with a myriad of thoughts. The younger of the two men stands on the right and looks out at us. His is a strangely challenging and intense gaze. When you look at this painting what are the first questions you want answering? I am assuming you want to know who the two men are but I wager, you also want to know even more about what is written on the piece of paper and what does it have to do with the two men. Maybe you are also wondering why the artist would have portrayed one of the men pointing to the writing on the piece of painting. What is so important about the Latin words we see on the unfolded sheet? That might not exactly tell us who the two men are but we do know that Pontormo at one time worked at the studios run by his tutor and master, Andrea del Sarto and that del Sarto had a friend Domenico di Jacopo who was a glassmaker by trade and because of that was nicknamed Bicchieraio (Italian for glassmaker). 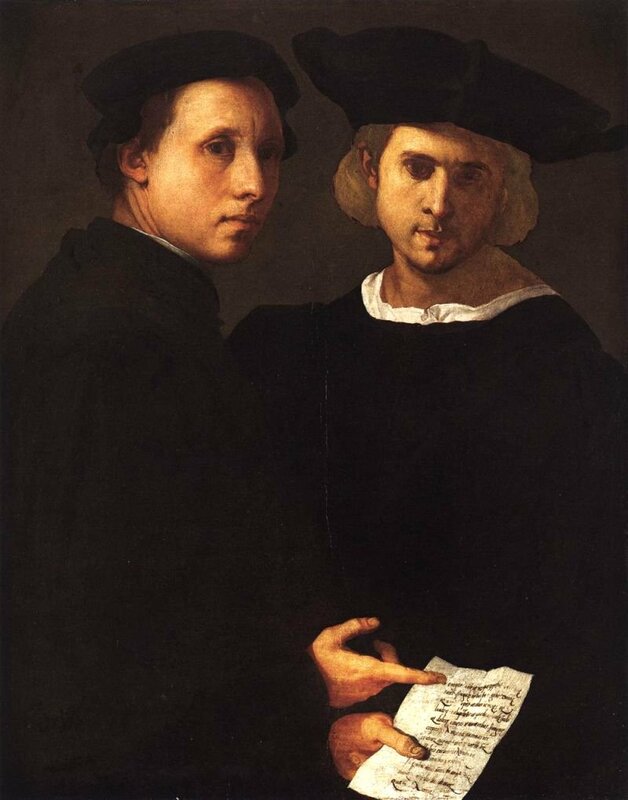 Maybe it is a leap of imagination too far, but let us remember that the Latin words on the piece of paper were from a dialogue between a father and his two sons-in-law and we now know that one of the sitters in today’s painting was a son-in-law of Becuccio Bicchierario. Furthermore, we know he had a second son-in-law and thus we may be able to deduce that the two men looking out at us are the husbands of two of Bicchieraio’s daughters, who probably Pontormo came across through his association with his old master, Andrea del Sarto. It is also probable that the glassmaker commissioned Pontormo to paint the two men in his daughters’ lives and by adding the piece of written paper he was drawing a parallel to Cicero’s Amicitia and the requirements for true friendship which he hoped would be in place between his daughters and their husbands.. So there you have the solution to the mystery of the painting, or do you? Well notwithstanding my step by step reasoning for what we see in today’s work and whether you believe my reasoning. I believe it to be a classical study and that little bit of paper, to me, adds a little spice to the offering.